Our rental line is characterized by breadth and depth of offering, vision of the manufacturers and quality of their products. In most cases, we provide two or three solutions to a specific problem. This depth of offering allows us to meet our customers’ needs, regardless of the genesis. We have carefully selected the vendors whose products we represent. 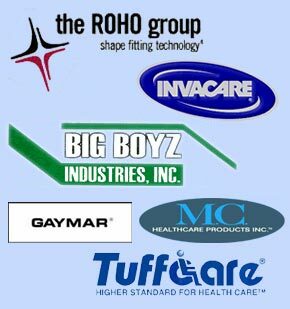 Vendors such as Invacare, ROHO, and Gaymar, among others, are well known and respected by caregivers and competitors alike. These companies conduct ongoing R&D in support of their manufacturing efforts and, as a result, their products embrace both the latest in technology and the latest thinking in patient care. Click on a Category in the SOLUTIONS MENU for further product information or call us to discuss your needs and potential solutions.